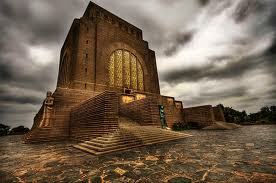 alot of Information on South Africa.Just click on to the Enter button. 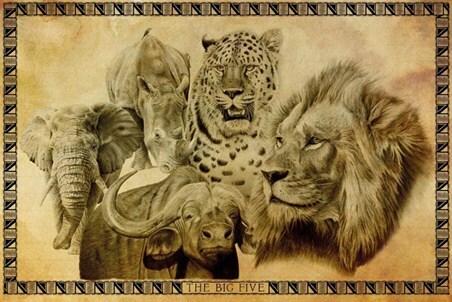 In Africa, the big five game animals are the lion, African elephant, Cape buffalo, leopard, and rhinoceros.The term big five game (sometimes capitalized or quoted as "Big Five") was coined by big-game hunters and refers to the five most difficult animals in Africa to hunt on foot. 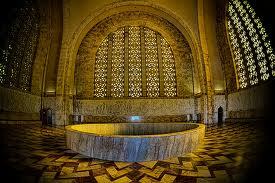 Subsequently the term was adopted by safari tour operators for marketing purposes. 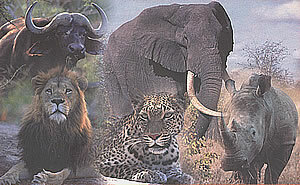 The term is still used in most tourist and wildlife guides that discuss African wildlife safaris. 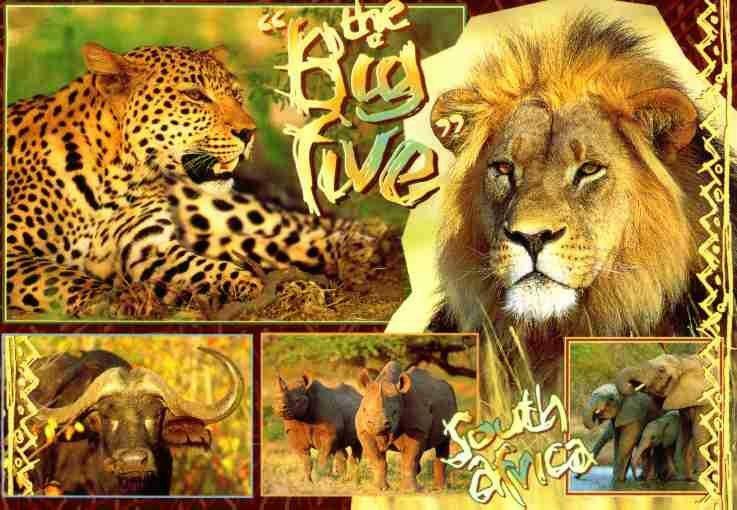 The members of the Big Five were chosen for the difficulty in hunting them and the degree of danger involved, rather than their size. 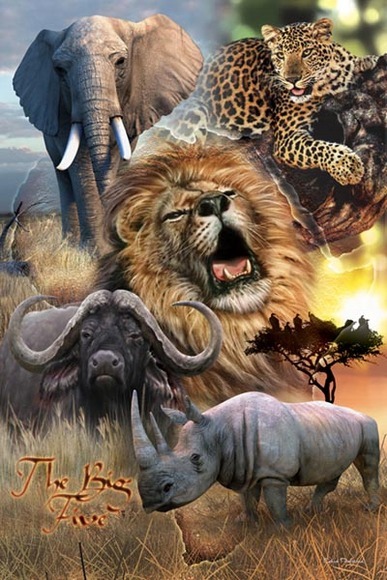 The big five are among the most dangerous, yet most popular species for big game hunters to hunt.Safari Club International, an organization dedicated to trophy hunters, offers a trophy for hunting all five species, called the "African Big Five Grand Slam," along with 14 other Grand Slams for other species, and a total of more than 40 different awards. 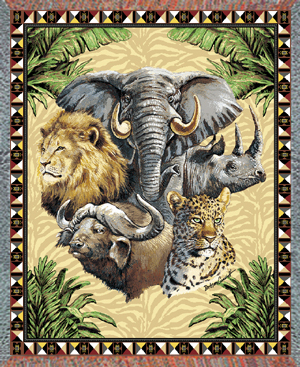 The 1990 and later releases of South African randbanknotes feature a different big-five animal on each denomination.Countries where all the members of the big five can be found include Namibia, South Africa, Kenya, Tanzania, Zimbabwe, Botswana, and Democratic Republic of the Congo. 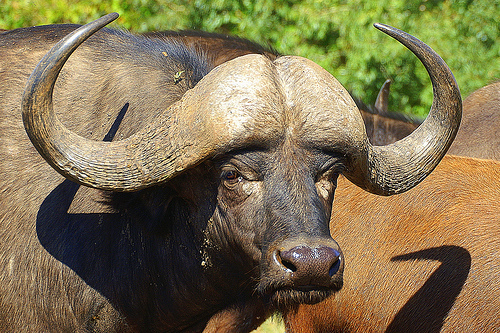 According to recent studies, it is difficult to spot the rhinoceros in Botswana. The African elephant is a very large herbivore having thick, almost hairless skin, a long, flexible, prehensile trunk, upper incisors forming long curved tusks of ivory, and large, fan-shaped ears. There are two distinct species of African elephant: African forest elephant and the African bush elephant . 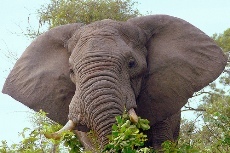 The elephants are difficult because despite their large size, they are able to hide in tall grass and are more likely to charge than the other species. 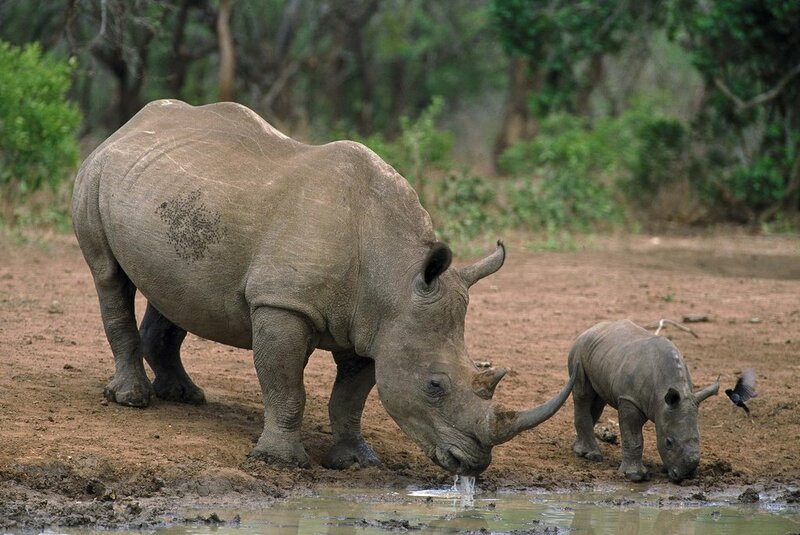 The black rhinoceros is a large, thick-skinned herbivore having one or two upright horns on the nasal bridge. Rhinoceros may refer to either black or white rhinoceros. Among big five game hunters, the black rhinoceros is preferred, although it is now critically endangered.The black rhinoceros or hook-lipped rhinoceros is a species of rhinoceros, native to eastern and central Africa including Kenya, Tanzania, Cameroon, South Africa, Namibia, Zimbabwe, and Angola. Although the rhinoceros is referred to as black, its colors vary from brown to gray.The other African rhinoceros is the white rhinoceros . The word "white" in the name "white rhinoceros" is a misinterpretation of the Afrikaans word wyd, itself derived from the Dutch word wijd for wide, referring to its square upper lip, as opposed to the pointed or hooked lip of the black rhinoceros. These species are now sometimes referred to as the square-lipped (for white) or hook-lipped (for black) rhinoceros.The species overall is classified as critically endangered, and one subspecies, the western black rhinoceros, was declared extinct by the IUCN in 2011. 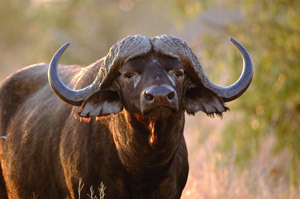 The African or Cape buffalo is a large hornedbovid. 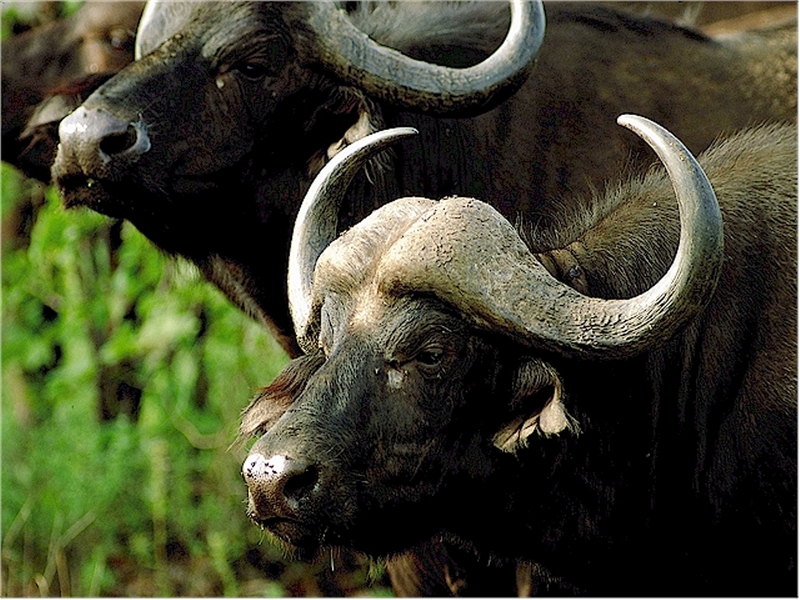 Buffalo are sometimes reported to kill more people in Africa than any other animal, although the same claim is also made of hippos and crocodiles. 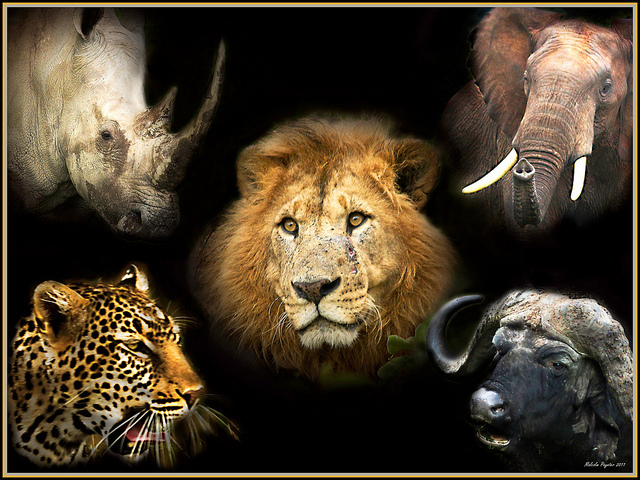 It is considered the most dangerous of the big five, reportedly causing the most hunter deaths, with wounded animals reported to ambush and attack pursuers. The lion is a large carnivorousfeline of Africa and northwest India, having a short, tawny coat, a tufted tail, and, in the male, a heavy mane around the neck and shoulders. 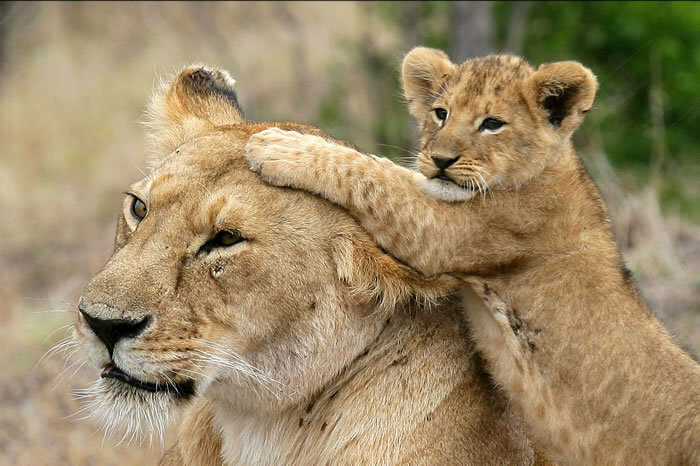 Lions are desirable to hunters because of the very real danger involved. A lion may attack without provocation, and is considered by many to be the best of the big five, Lion hunting is challenging because of the habitat and temperament of the lion. Lions live in the savanna where tall grasses, shrubs and bushes obscure and provide them cover and camouflage. This thick undergrowth is commonly referred to as jess. As lions are ambush hunters, they use this natural cover to stalk close as possible before making a final charge to catch their prey. Lions do not generally avoid confrontation, but will usually face the challenger. Lions are unpredictable and may charge when sufficiently annoyed or confronted by danger. 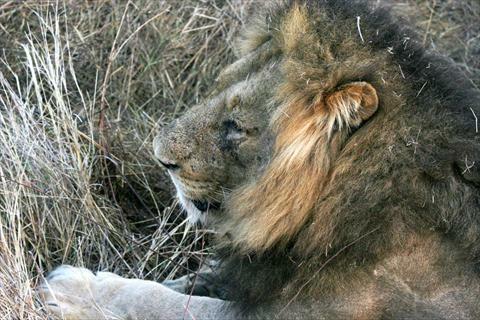 These factors together make lion hunting a challenge to hunters. Lions are hunted by three methods: baiting, stalking, and hounding. The hunting method is dependent on firstly the law, then the number of lions in a given area, terrain, the professional hunter or concession owner or the hunting outfitter, their expertise and the client.Baiting involves the hunter lying in wait in a natural or constructed blind. Prior to the lion hunt, a prey species is hunted beforehand for use as bait. The bait is then secured to a tree or secure structure in an area which is known to be frequented by lions; usually this will be close to a watering hole. The bait is checked regularly until there are signs the carcass has been visited by a lion. Then a blind is constructed, usually 30–50 yd (27–46 m) from the bait where the hunting party can remain concealed, usually from early evening until early morning the next day. Stalking involves driving along trails in areas where lions are known to inhabit. Once fresh faeces are sighted, the hunting party (which includes trackers) dismounts. The trackers follow tracks and spoor signs while scanning for the lion. When the lion is spotted, the professional hunter and the client will stalk in close until they reach a good shooting position. Hunting lions by stalking is conducted in daylight hours when there is sufficient light to spot the lion, which would usually be resting. 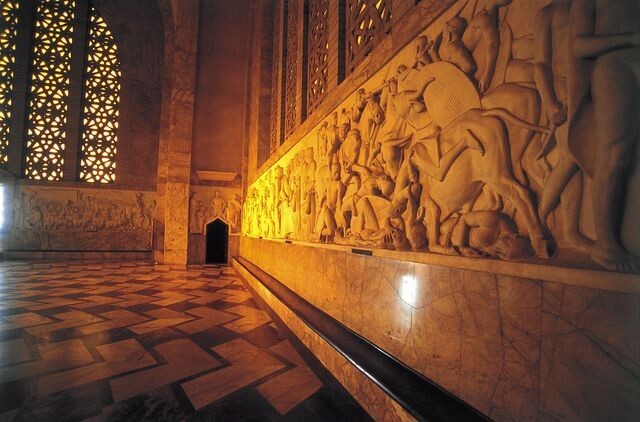 Night stalking using electric light sources is banned in most countries. Lions hunted with lights may not be listed as trophies by Safari Club International.Hounding, the least used method today, uses dogs, and may include a fighting pack and a tracking pack. 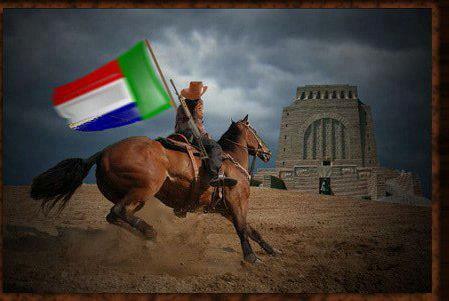 The hunting party will drive in known lion territory until fresh spoor is spotted, at which time the dogs are released. The pack follows the scent trail of the lion. Once the lion is encountered, the pack attempts to hold the lion at bay until the hunting party arrives to dispatch the lion. Like stalking, hounding is usually conducted during daylight hours. The lion will usually stand and fight rather than flee. Many concessions in Africa have been known to release captive lions into enclosed areas where they may be hunted with or without the client's approval and/or knowledge. Sometimes the lion is drugged to slow it down, making it an easier target. Many hunters and hunting organizations consider this unethical and an affront to fair chase practices of the hunt.The lion has thin skin and does not require the use of a big bore rifle. Furthermore, lions are evidently susceptible to hydrostatic shock when impact velocities are above 3,000 ft/s (910 m/s). Lion require at a minimum a .300 Winchester Magnum. However, certain jurisdictions require a minimum a .375 H&H Magnum or a 9.3x62mm Mauser as a minimum caliber. A few professional hunters are known to carry 12-gauge semiautomatic shotguns loaded with buckshot as a back-up weapon when hunting lion. The leopard is a large, carnivorous feline having either tawny fur with dark rosette-like markings or black fur. 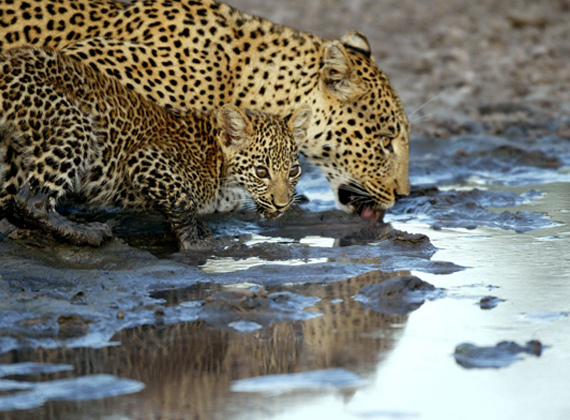 Of the big five, it is most difficult to acquire hunting licenses for leopards. The leopard is sometimes considered the most difficult of the big five to hunt because of their nocturnal and secretive nature. They are wary of humans and will take flight in the face of danger. The leopard is solitary by nature, and is most active between sunset and sunrise, although it may hunt during the day in some areas. Leopards can be found in the savanna grasslands, brush land and forested areas in Africa.Leopard hunting uses the same methods as hunting for lions. Baiting, hounding, and stalking are the most common methods used today to hunt the cat. 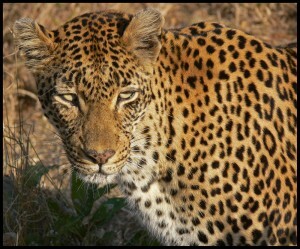 Baiting is the method most often used to hunt leopard. This requires the finding and then following of spoor in an area known to be frequented by a leopard. Once a suitable area is located, a prey species is hunted and used as bait. Because of the nocturnal nature of the cat, the blind needs to be constructed close to the bait, as shooting will more than likely be during the night. The client and the professional hunter will spend the night in the blind waiting for the leopard to come to the carcass.Hounding with dogs to hunt leopard requires the hunting party to locate an area where a leopard has been recently active, as in the baiting method. Once such an area is located, the dogs (usually bloodhounds or ridgebacks) are released. The dogs attempt to pick up the scent and follow it to the leopard. 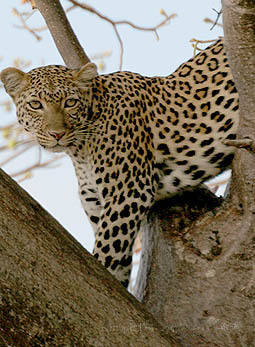 The leopard will usually flee from the loudly baying dogs and take refuge in a tree or in an area out of their reach. The dogs will hold the leopard at bay in this manner until the hunting party arrives to dispatch the leopard. Stalking is rarely used to hunt leopard, as it is extremely time-consuming, tedious and has a very low success rate. A month-long hunt using the spot and stalk method may not be successful at even sighting a leopard.The male leopard is less than half the size of a male lion. The leopard is the smallest of the big cats, and rarely exceeds 200 lb (91 kg).There is a concerted effort to stop the hunting of the leopard due to the rarity of it and any subsequent big cat.